The main reason this website exists is that Buzz Aldrin deployed on the Moon only two active experiments in the early Apollo surface experiments package (EASEP) about 17 m from the lunar module. By far the largest was a large gold cylinder was the Passive Seismic Experiment (PSE) weighing 47 kg designed to measure Moon quakes. Fig. 1 Buzz and LM vista. Bolted on it, so Buzz did not need to use any of his million dollars a minute time on it, is a tiny very simple Dust Detector Experiment (DDE) weighing 270 g was one I had invented 12 January 1966 Fig.2 DDE with one cent piece to measure movements of fine dust and their effects on changing the temperature of what the dust so thoroughly stuck to. The Apollo 11, 12, 14 and 15 DDEs and some other material provide the new information. As Gene Cernan, the last man on the Moon, said in his debriefing "I think probably one of the most aggravating, restricting facets of lunar surface exploration is the dust and its adherence to everything no matter what kind of material, whether it be skin, suit material, metal, no matter what it be and it's restrictive friction -like action to everything it gets on". Gene and I shared our views about lunar dust for a couple of hours in Perth in 2016 as I showed him the Apollo 11 and Apollo 12 versions of the DDE Fig. 3. He looked very different from when he walked on the Moon Fig 4 and a little different from when I had lectured to him 7 years before that wondrous journey. The main reason this website has been published at this time is that world-wide celebrations of the inspirational 50th anniversary of Apollo 11 are already being prepared. I am writing a book tentatively called "Apollo 11, Serendipity and Dust on the Moon" and progressively draft slices of the draft manuscript will be shown from month to month here as I progress. Sadly, my reasons for speeding are the great deal of incorrect and absent information at present about movements of dust and about DDEs in official reports and displayed for more than a decade historically in many websites with omissions and misinformation about dust on the Moon. Since 2006 when I first became aware of early NASA NSSDC website errors, I have tried to have key errors corrected. From time to time they have contaminated other websites and beliefs held by some scientists and engineers, and may of course contaminate many more. The major NASA Website, that of NASA Space Science Date Coordinated Archive (NSSDCA), is very important and valuable to global communities. Here we show two examples of long-lasting (2008 to 2018) unforced errors in NSSDCA Websites relating to Apollo 11 and our Dust Detector Experiment (DDE). Because of the public need for reliable information about dust effects during the historic first rocket launch from the Moon by Apollo 11, in May 2018 I once again attempted to have the NSSDC unforced errors corrected. In early September I intensified such attempts. On or about 14 September servers to the site ended. On 19 November, the NSSDCA Website apologised and gave notice that the server would return in about a week. We record some of the historic errors primarily because memories of these unforced errors will linger for some time, confusing rational discussions for some unknown time after a replacement new NSSDC website is operational. We look forward with all good wishes to NSSDCA websites being fully operational again in the near future, to serve their legitimate and critically important roles in the forthcoming global celebrations of the 50th anniversary of Apollo 11 splendours. The updated NSSDCA websites are now available since late November 2018. We show our responses in our new Blog. In summary, we show evidence that the two major Apollo 11 Updated NSSDCA Websites about spacecraft EASEP and experiment Apollo 11 DDE do not meet the requirement given with the logo of NSSDCA that the websites contain space science mission data. Instead, the Updated Versions 5.0.1 for these two high-profile websites conceal or hide the published and publicly available measurements or space science mission data. They are also unacceptable in additional ways. We respond to them with a concept that the appropriate NSSDCA Websites be revised to make them space science mission data, consistent with both the mandatory openness of NASA data and our matching policies and practices for Apollo dust research, to the extent practicable for self-funded projects. 2. increase the suitability of the NSSDCA websites for celebrations of the Apollo 11 50th anniversary. On 20 June 2012 Buzz Aldrin revealed on YouTube his secret agreement with Neil Armstrong. Buzz waited about two generations. I strongly recommended a similar discretion in my 16 August 1969 Second Progress Report to Professor Harry Messel. Harry immediately agreed. None of the 4 of us wanted to "rain on the parade" of the most magnificent Apollo 11 mission. And yet, for the safety of future missions, the truth had to be made known quickly for this mission, for Apollo 12 and all later missions. There were also scientific aspects for early, but not too early, disclosure.There were 142 geologists from around the world, Principal Investigators with samples of rocks brought back from the Moon from areas close to the Apollo 11 Lunar Module. They needed to know urgently if their samples might have been contaminated or physically moved by rocket exhausts during the descent of the Lunar Module.This Website will show later and sadly just what really happened with unnecessary controversy about Apollo 11 DDE measurements. Further, I could not get the true Apollo 12 dust discoveries published until 2009. I'll tell that story later in full. The Apollo 14 TDS experiment and the Apollo 17 LEAM experiments are two dust-related Apollo experiments other than the Dust Detector Experiments (DDEs) which are also critically important. They and the Apollo 11, 12, 14 and 15 DDEs are essential for balanced, public, measurement-based knowledge and understanding about the properties and movements of fine dust inescapably encountered by Apollo astronauts and equipment, including other scientific experiments. Future expeditions need reliable information. I also include here photographic evidence from my second favourite Apollo experiment, the Thermal Degradation Samples (TDS) experiment performed and photographed by astronaut Alan Shepard on Apollo 14. Figure 5 (magic numbers built of lunar dust). Like the Dust Detector Experiments (DDEs), the TDS and its vitally important discoveries remained unknown and neglected by lunar scientists for almost 40 years until I discussed them at two conferences in Ames 2009 and Boulder 2010. By contrast, one particular complex interpretation of the Apollo 17 LEAM experiment had become very popular and influential from 1975 for more than 30 years while the TDS and DDEs were ignored. In 2010 after considering 1973-74 raw data from LEAM, I challenged the popular beliefs about causes of measurements by LEAM in a conference in Boulder Colorado and then followed up in a peer-reviewed publication in 2011. In summary, I considered it likely that LEAM signals were simply noise interference instead of the popular levitation of dust particles.This website will attempt to help those interested by giving references to the complete available information for TDS and LEAM, and the related measurements by the LADEE lunar orbiter in 2013-15. The TDS had a sad fate. The two plates were taken a to Houton, put in quarantine, and lost. Strangely, such a simple, low-cost and versatile dust experiment was never attempted with or without variations again. Curiosity to learn more about dust was feeble at MSC. The information about the movements of dust which I place on this website is all based on fact, measurements and peer-reviewed publications of my 14 peer-reviewed discoveries to date from DDE data and related issues. Curiously, despite the visible problems encountered by Apollo astronauts and equipment, our discoveries remain the only such published measurements and discoveries to date from the Moon. Few other scientists refer to TDS discoveries even in 2018. Remarkably, the Apollo 14 TDS experiment was the only one to ever use human capabilities of an astronaut (in this case, Alan Shepard) to investigate properties of the fine dust that troubled them all. My beloved wife Avril and I met Alan Shepard and his wife one evening in late 1963 or early '64. Rice University Pres Ken Pitzer invited us and the original seven astronauts and their wives to a small and short evening celebration with double Nobel laureate and close friend of Ken, Linus Pauling. Avril and I had booked seats at the Perth concert hall for a recital by Arthur Rubenstein, and she had bought a special new tightly-fitting olive green dress for that occasion. It was a few months after the birth of our second baby Roz , and Avril had got an even better figure back, and she knew it. So did I, but then she was always beautiful, with a lovely gentle voice. Alan quickly noticed. Avril had been torn that morning by priorities between her favourite Beethoven by a pianist she had never dreamed of hearing live, and meeting the first 7 super heroes of space. As we all relaxed and mingled, Alan and Avril clearly delighted in their conversations, all in a very polite and genteel way. However, after about 10 minutes or so the voice of Alan's wife carried in an edgy sharpish tone across the room calling "Alan, come here." And then again "Alan, come here". So Avril and I watched quite calmly the departure of the first hero of the US space program, whose successful May 1961 15- minute flight on a Redstone rocket encouraged Pres John F. Kennedy to make his the historic Camelot yet King Arthur call for national support of what became the Apollo program with 400,000 workers. Alan walked quite quickly to his beautiful statuesque Californian wife. Avril said later that he had trotted back to his quite-tall blond wife. Fortunately for us, Professor Pauling called an early night, and we got to the Houston Concert Hall in time for the second half of the magic joys produced by such stumpy short fingers. Avril used to enjoy telling the whole story later to the family with vivid colour descriptions of Mrs Shepard's dress and shoes. Avril was herself a fine and delicate pianist, the daughter and often accompanist to Etta, who even at the age of 80 sang in a beautiful velvet contralto voice the product of years a very hard work and excellent training on Covent Garden opera stages. Etta's granddaughters and great granddaughters also seem to have inherited many actress characteristics. 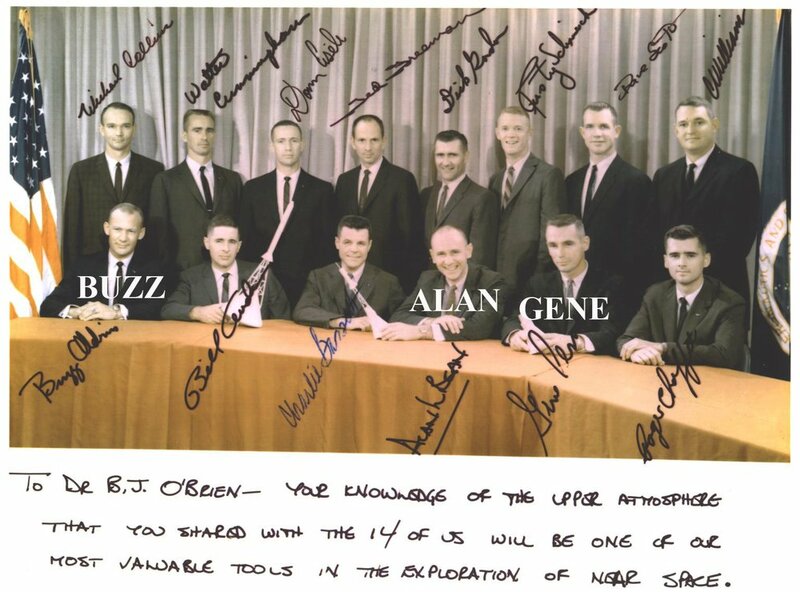 Many such personal encounters with several Apollo astronauts feature large in my memories and information bank They began en mass, with me giving three or four lectures to the astronaut class of '64 (Fig.6), arguably the best classes I've enjoyed. Apart, that is, from the Rice University classes of 12 Professors and 50 senior undergraduates, I organised about Leonardo, a completely different experience, physically, emotionally and intellectually.